Wind is an infinitely renewable supply of power that can be harnessed as an outstanding energy source given the proper location and use of the latest turbine generation technology. Major power producers world-wide have adopted wind power, a clean source of energy that can last up to 20 years or more, as an economically viable alternative to fossil-fueled power generation. Wind farms can fluctuate in size depending upon the availability and strength of their surrounding airstreams. 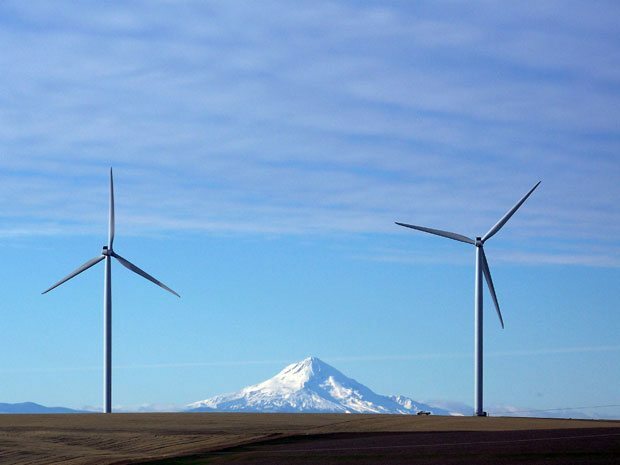 Wind farms are beginning to increase in magnitude as utilities are starting to see the significant amount of electrical generating capacity that can be added to their overall production. Within a farm, individual wind turbine generators are interconnected with a medium voltage collection system and communications network. This medium-voltage electricity is then stepped up with a transformer to a high voltage transmission system and the electric grid. As the number of wind turbine generators increases within a farm’s configuration, the need for managing those assets becomes progressively more important. Emerson’s Ovation SCADA solution can manage your wind farm generation resources to help minimize turbine generator downtime and maximize their availability. Based on the Ovation SCADA Communication Server, our solution features state-of-the-art control and diagnostic functions to optimize your wind farm operations. Supervisory control of each wind turbine generator includes start, stop, reset, and tag out functions. An interactive wind farm overview graphic provides convenient operator access to these functions. This graphic can be customized to match the configuration of any wind farm. Select any one of the wind turbine generator symbols within the display to access a graphic control window. This window contains built-in buttons that help the operator manually control the turbine through start, stop, and reset functions. A tag out button is provided to place a turbine into maintenance mode. Permissive interlocks are built into this function for accomplishing this activity in a safe manner. A reset button clears the tag out condition once the maintenance has been completed. The Ovation SCADA server control window also provides a means to send a speed set point to the wind turbine generator. This function can be used to activate a change in speed (faster or slower) to within a range specified by the turbine’s original equipment manufacturer. 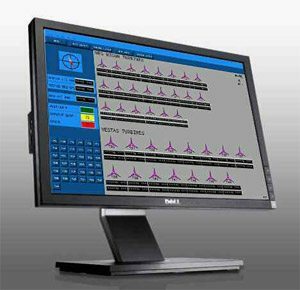 While the control window offers these functions for manual operator intervention, the Ovation SCADA system is designed to accomplish many of these functions automatically. The wind turbine generator symbol on the overview graphic changes color depending on the state of the selected turbine. Protective supervisory shutdown is an inherent function in the Ovation SCADA solution that protects the wind turbine generator. This function is automatically performed by the Ovation SCADA Server when certain predefined site conditions are reached. For example, the direction and speed of wind on a farm can randomly change at any time. A typical wind farm configuration consists of rows and columns of turbines that in some instances can be located close together. Strong winds that blow directly parallel to a row of turbines can potentially cause damaging vibrations to the turbine blades. Vibration conditions can be monitored through meteorological data obtained from a Met tower interface to the Ovation SCADA system. When the vibrations exceed a safe operating limit, the Ovation SCADA system activates a shutdown of the turbine to avoid any equipment or area damage. Once a turbine is shutdown by the protective supervisory shutdown function, it can only be manually reset by the operator provided all of the adverse conditions that caused the shutdown have been restored. A programmed supervisory stop is similar to the supervisory shutdown function except that it is based on other conditions that may be present at a wind farm site that are not related to safety issues. For instance, depending on the direction and angle of the sunlight, the rotating blades of a wind turbine can sometimes have an adverse stroboscopic effect on humans looking at the rotating turbines. Consequently, in some wind farm locations, due to local regulations, one turbine or a group of turbines may have to be stopped at certain times of the day to alleviate the stroboscopic condition. The Ovation SCADA system allows the user to program supervisory stops to accommodate issues such as the stroboscopic effect caused by local conditions. Another key difference between the supervisory stop and shutdown functions is that the user can choose to let the SCADA system automatically restart from a programmed stop or elect to use a manual start. Ovation doesnt appear much different to other SCADA systems in my opinion. Every wind farm SCADA system I have used focuses heavily on data visualisation and historisation and offers very little in the way of meaningful analytics. Also i think it is strange to rely on the wind-farm-wide SCADA system to perform ciritical protection functions (like wind sector management mentioned above). The turbine’s own protection systems should adequately protect it if wakewash is causing turbulence. For more information on some interesting analysis that can be done with wind farm SCADA data, check out http://www.scadaminer.com.